Russia has ordered a crackdown on Georgian-owned businesses and tighter visa measures as part of the nations' escalating diplomatic dispute. Russia's parliament has backed tough sanctions against Georgia, which President Putin accused of "blackmail". 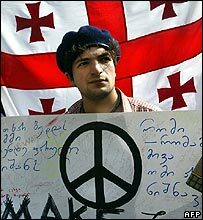 Growing tensions between the countries erupted when Georgia arrested four Russian officers it said were spying. Moscow has cut postal and transport links between the countries. Georgia's president accused Moscow of "bullying". 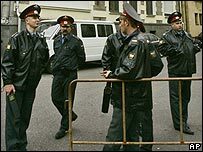 Several businesses owned by Georgians in Russia have been closed down by the authorities. Two popular casinos, two Georgian restaurants and a hotel have been raided, accused of financial irregularities. President Vladimir Putin's official spokesman, Dmitri Peskov, told the BBC that they were accused of channelling funds to help in the rearmament of Georgia. "We have been witnessing unbelievable militarisation of Georgia... we have some facts that money being sent to Georgia are being used for that purpose," he told BBC Radio 4's Today programme. "Our interior ministry has pointed out that these restaurants and casinos were under the control of illegal groups of Georgian origin." He said the sanctions were not a direct response to Georgia's arrest of four officers last week, but followed "a history of hostile behaviour by Georgia". Russia's migration service said on Thursday that the suspension of visas to Georgians would be extended, and that 180-day visas held by Georgians already in Russia would be cut to 90 days. Meanwhile, some Russian schools in Georgia have refused to admit their Georgian pupils, reportedly under orders from Moscow. Georgian President Mikhail Saakashvili remained defiant. As his governing party faced nationwide local elections on Thursday, he insisted that he would keep Georgia on the pro-Western path he has followed since he came to power following a revolution in 2003. Correspondents say President Putin is alarmed by Georgia's closer links with the West, and that he is determined to prevent it joining Nato. But Mr Saakashvili said his government's commitment to joining Nato was unwavering, and would provide "additional guarantees of security". Georgian Prime Minister Zurab Nogaideli added that: "Russia has implemented sanctions before and we were able to stand our ground. We are standing our ground now."